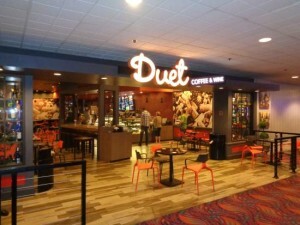 The above picture was taken from the Aquarius Casino Hotel coffee shop, called the Duet. This casino is located along the Colorado River in Laughlin Nevada. street on Casino Boulevard. Laughlin Nevada is a really great place to come visit and to play the slot and table games at the casinos. There is a boardwalk on the Colorado river that runs past on the casinos. You can usually walk the half-mile between the casinos and visit each one. Harrahs Casino is a bit further and you have to go to the street to get to that particular casino. Make sure you get a slot card. Use it in the slot machine to make sure you get whatever comps are available to you. This is the primary way that the casinos reward their best customers. If you’re driving to get to Laughlin Nevada from Vegas, Palm Springs, Los Angeles, Kingman and any other location make sure you fill up with gas on the Arizona side of the Colorado River. The prices are quite a bit cheaper for gas and you get the deals in terms of car washes and oil changes.